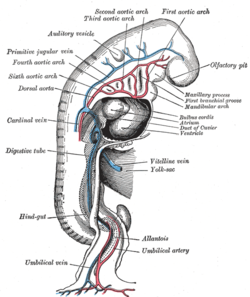 This article is about the embryonic artery. For the artery in adult fish, see Aorta § In other animals. The dorsal aortae are paired (left and right) embryological vessels which progress to form the descending aorta. The paired dorsal aortae arise from aortic arches that in turn arise from the aortic sac. Each primitive aorta anteriorly receives the vitelline vein from the yolk-sac, and is prolonged[clarification needed] backward on the lateral aspect of the notochord under the name of the dorsal aorta. The dorsal aortae give branches to the yolk-sac, and are continued backward through the body-stalk as the umbilical arteries to the villi of the chorion. The two dorsal aortae combine to become the descending aorta in later development.